Fairbanks is Alaska’s third largest city, sitting behind Anchorage and Juneau, but it’s a far cry from a Metropolis. I wouldn’t call it a pretty city, but it has its own charm and the University adds a youthful vibe that we totally dig. For us, rolling into Fairbanks was exciting on so many levels. We’re back in the land of fast 4G cell service, fuel is a fraction of the price vs. Canada and we have a full week of action packed celebration ahead including meet-ups with fellow travelers, Summer Solstice activities, our 9th anniversary and my 34th birthday. To simply say our time in this city flew by would be a total understatement! Midnight Sun Run – The 10k race was AWESOME! 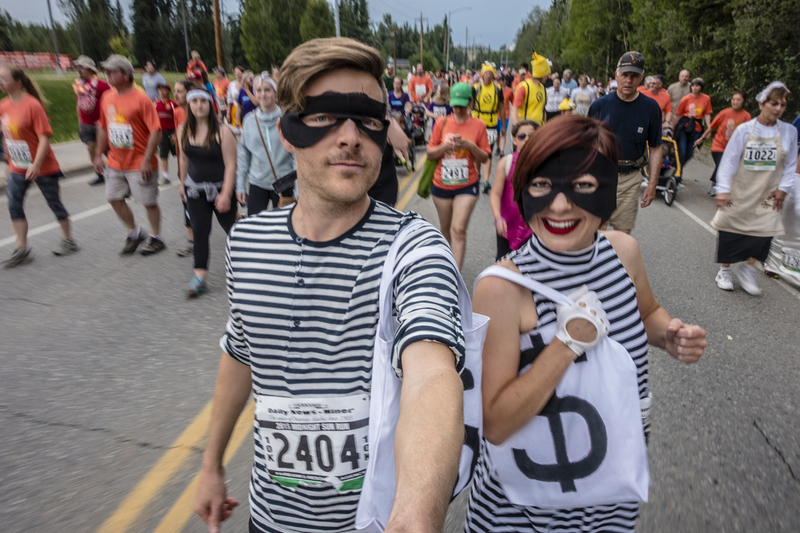 We’re not avid runners and this was our first organized running event since high school, but it benefits charity and costumes are encouraged, so we couldn’t say no. Fortunately there are people of all kinds out on the streets for this event. It’s not only an event for the participants, its one for the spectators & cheerleaders that create the block parties on the neighborhood streets. It makes for one fun run/walk/jog! We challenged ourselves to run 2.5 miles of the 6.2 miles and we succeeded in completing the 10k in just under 2 hours (which considering all the stops we made along the way, we thought this was decent). 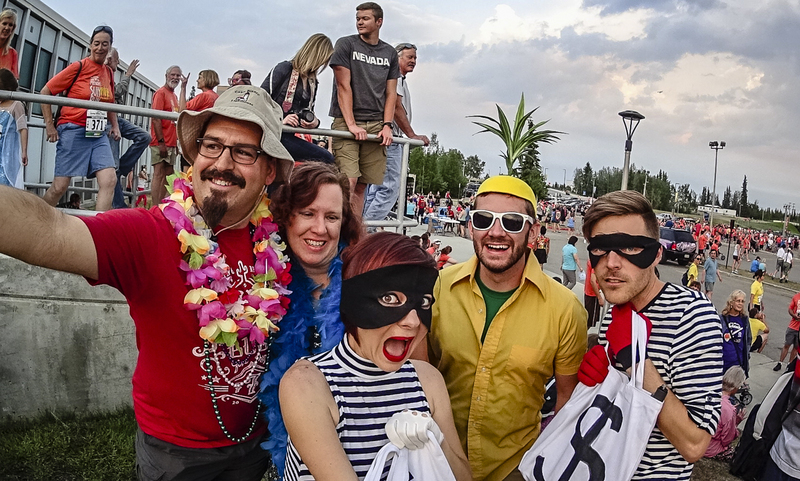 The event reminded us loosely of our debauchery at the New Belgium Brewing events we’ve attended over the years. 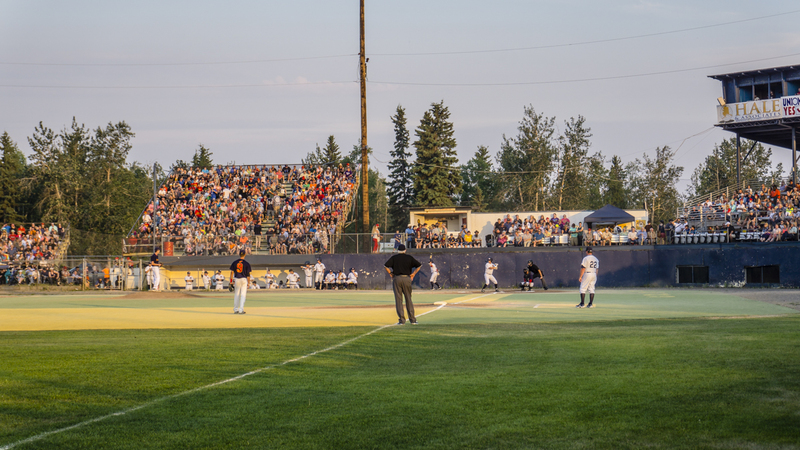 If you’re looking for somewhere exciting to spend the longest day of the year we can totally recommend Fairbanks. 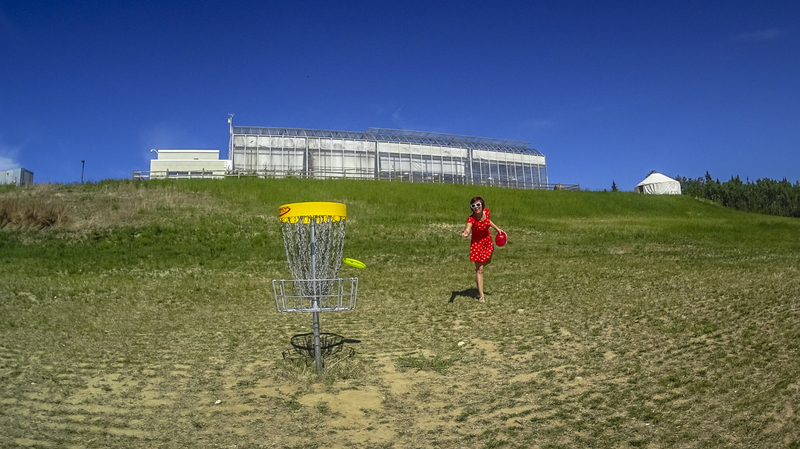 Disc Golf – The 9-hole UAF Disc Golf Course at the university is wide open and perfect for beginners, or if you just need to get out and stretch your legs in the warm sun. 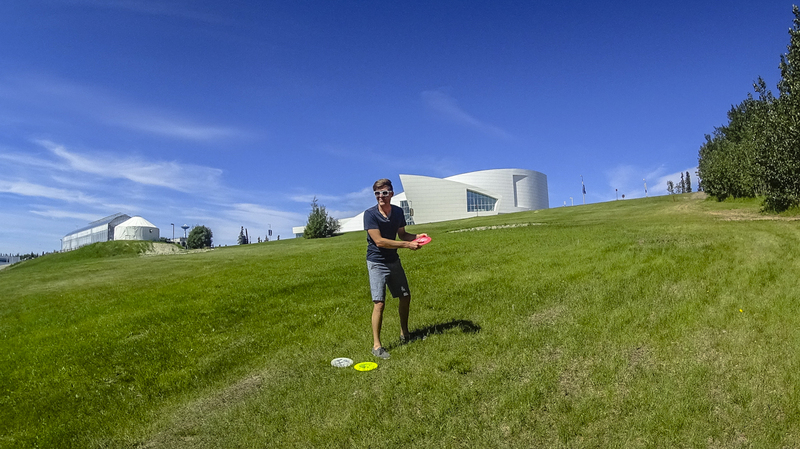 It’s right by the museum so you can kill 2 birdies with one “disc” if you’re into doubling up on your culture and history! However, even a seemingly easy course can be a challenge if you’re having an off day like Nikki was. She’s funny when she’s frustrated. 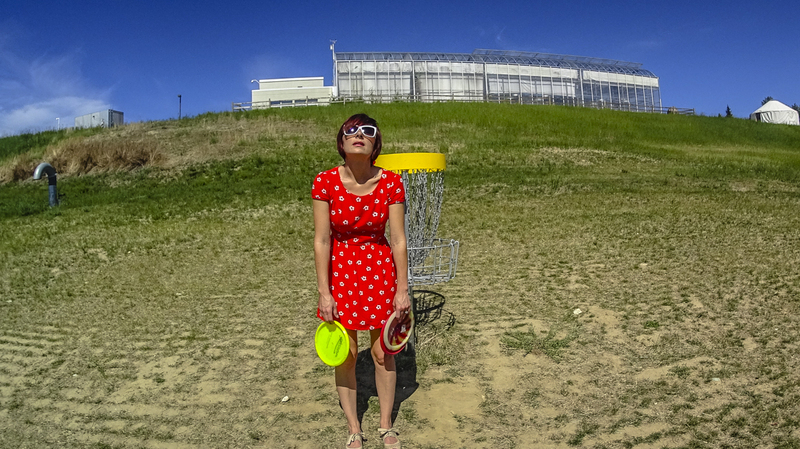 The nearby Birch Hill DGC is extremely challenging! They’ve converted the winter cross country skiing trails into a tree infested, tight fairway, disc eating course! Good news is we found discs for sale at the Sportsmen’s warehouse so you can restock your bag. In Fairbanks we stayed with friends via a little RV driveway surfing (Thanks Bonnie & Chris! ), I know that is not helpful to you but we did have friends stay at both Pioneer Park ($12/night 5 night max) and for free at Wal-Mart since they’re smack dab in the city and offer parking lot boondocking. One thing that is very helpful when driveway surfing (that we finally had the opportunity to test) is our Hybrid Inverter with a 15a outlet. 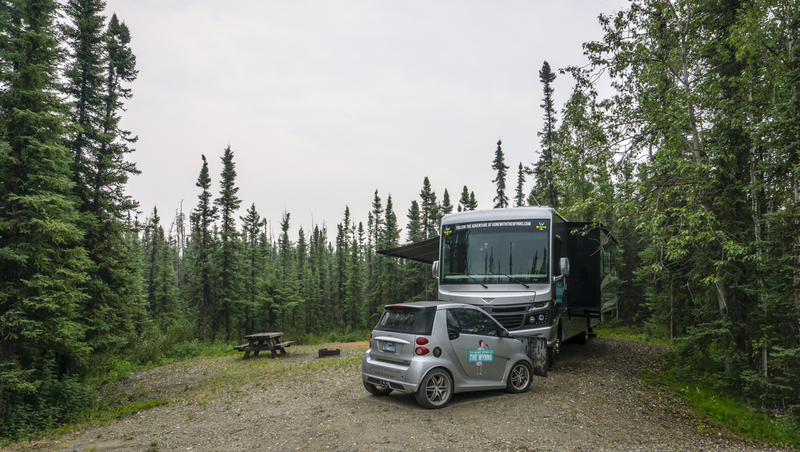 After a few breaker trips we got the inverter setup to pull a max of 7a, which allowed us to activate all our RV outlets and run the A/C using the combined power of our lithium batteries. 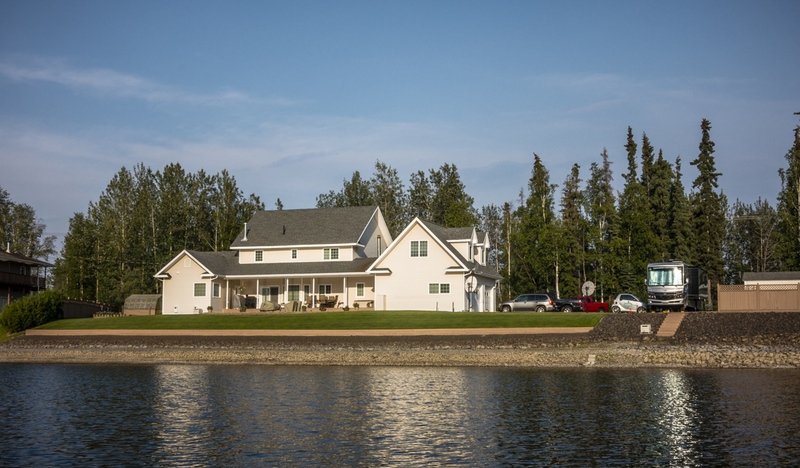 Tip – Don’t get confused like us, the Chena Lake Rec Area does have a dump station, but they do NOT have “pressurized” potable water, so fill up your tank in advance or stop by the nearby North Pole Tesoro gas station before you get out there. Seven of the nine days we were in Fairbanks were over 80 degrees and sunny causing the temps inside the RV tom reach 90+ degrees! Not exactly what we expected in Alaska! 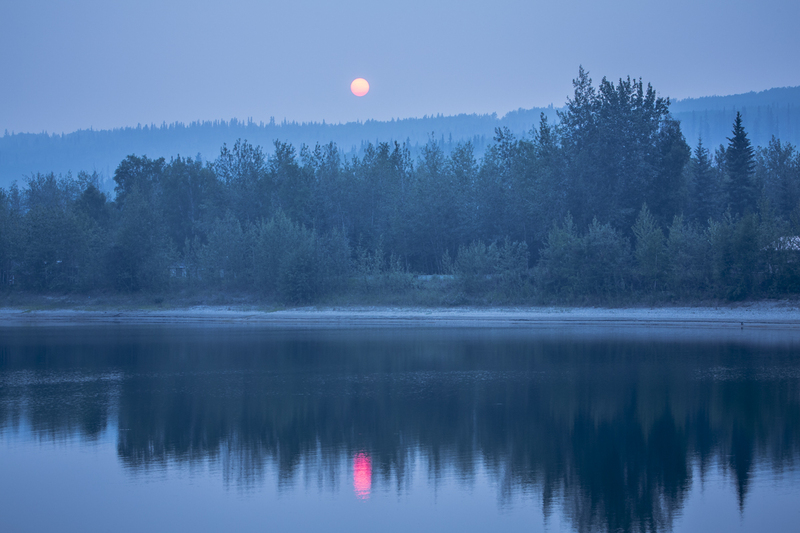 Apparently it’s common during the early summer for fires to break out all around the Fairbanks area (for various reasons) causing a thick layer of smoke to linger in the sky all the way down to Denali National Park area! Sometimes the smoke was so thick you couldn’t even see the sun in the sky. Some days we woke up to the smell of fire as if we left our campfire burning all night inside the RV. It’s not too pleasant and had us really feeling for the locals. It also led us to rethink and rework our planned travel route. This is a photo of the sun I captured one evening with the smoke so thick it more closely resembles the moon! We started our Beer journey at a place called The Banks Alehouse where we met up with our friends Jason and Kristen. It’s a sports bar that has a ton of AK beer on tap, we only drank here so I can’t comment on the food but it seemed like pretty typical pub fare. For dinner we hit up a little Thai food spot called Thai House Restaurant and we were totally surprised at the authentic flavors and spice! Turns out there are a ton of Thai food restaurants in this town so I guess they have to deliver top quality food to keep ahead of the competition. 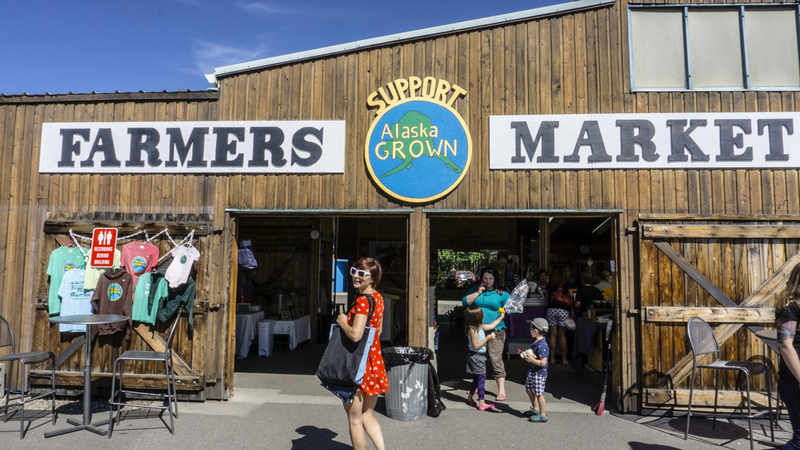 One afternoon we made our way to the Tanana Valley Farmers Market to pick up some local produce. It’s a tiny market, and we’re early in the season, but there are several vendors serving up quality looking produce and farm fresh eggs. 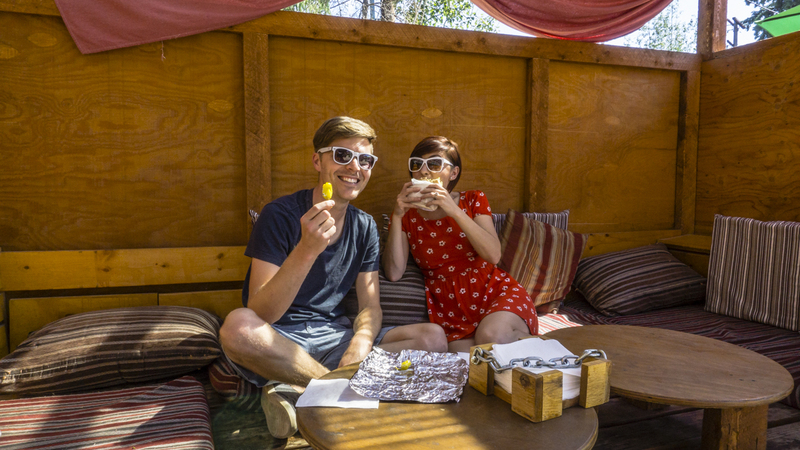 Best part of this journey was the discovery of one of the best falafel sandwiches we’ve ever had, it’s located just down the street from the market. It’s called the Pita Place and we were totally surprised by the fresh ingredients and authentic taste of our falafel sandwitch. 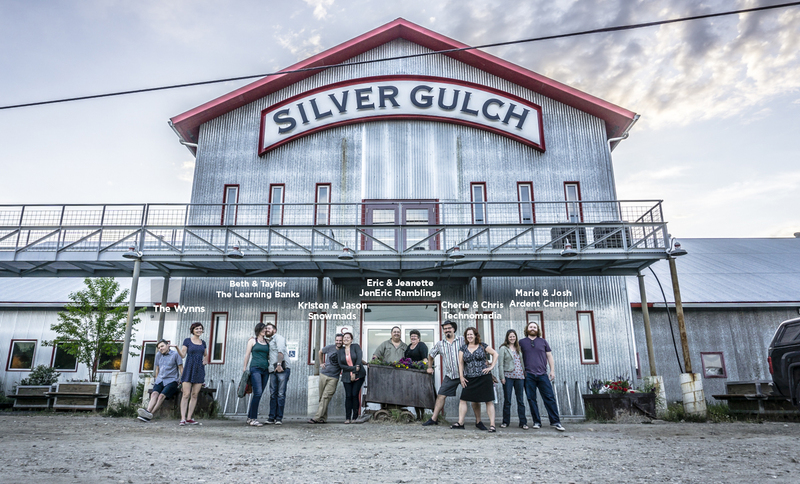 Silver Gulch Brewing and Bottling Company has a commercial that plays in Fairbanks that states “the best beer in the world is right here.” We thought the commercial was totally cheesy but for the sake of research (and meeting up with fellow travelers), we had to make the drive to nearby Fox, AK to sample the suds and eat at what many locals recommended as GREAT food experience. Overall it was good and totally worth the drive, but to call it the “best” might be a stretch. It is however the most northern brewery in America according to their website, so a good beer this far north might be automatically upgraded to a great beer! 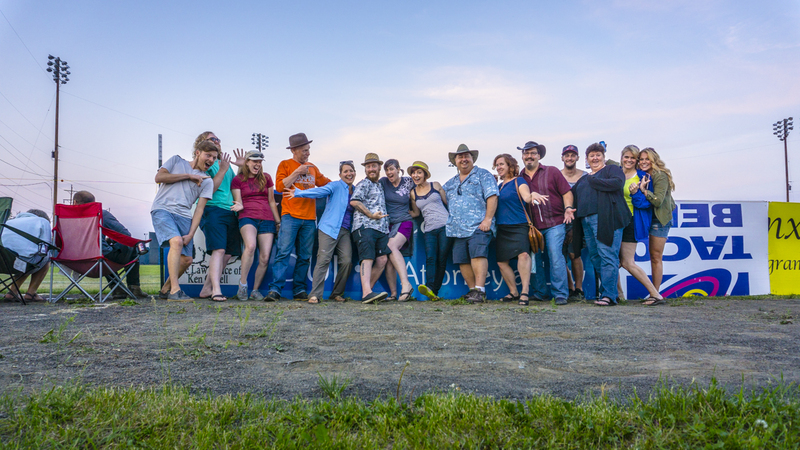 Us,The Learning Banks, The Snowmads, JenEric Ramblings, Technomadia & Ardent Camper. A little tip – If it’s a hot day DO NOT sit upstairs. This place doesn’t have A/C and for some reason they won’t open the windows so it’s hot up there, maybe they do this so you’ll drink more beer!?! If so, genius! Our 9th wedding anniversary was June 9th and my (Jason) 34th birthday was June 22nd. Now, everyone celebrates differently and for us we try to make big deals of the 5’s and 0’s and keep everything in-between more low key. So this year was spent enjoying festivities, friends and gifting each other fishing gear ($220 for poles, lures and such) and Alaska fishing licences ($145 per person). I know it doesn’t sound very romantic but it was lots of fun. The big question is, what are we going to do next year for the big 10 year anniversary and my 35th birthday? Maybe an international celebration? We were on the fence about the Dalton Highway and we must have gone back and forth a dozen times whether or not we’d attempt to travel it. In the end we decided there wasn’t enough time to do it and we really wanted to get away from the smoke. Many people make a day trip out of the drive to the Arctic Circle sign, take a photo, then make the 6 hour trek back to Fairbanks. Now that just seemed ridiculous to us because if we were going to drive all that way, we wanted to camp out for at least a day or two. After visiting the Public Lands office in town we found just 2 hours beyond the sign and past all the “boring mosquito infested tundra” is the stunning Brooks mountain range that rises up from the flats. I’m totally sad we didn’t get to see this with our own eyes. 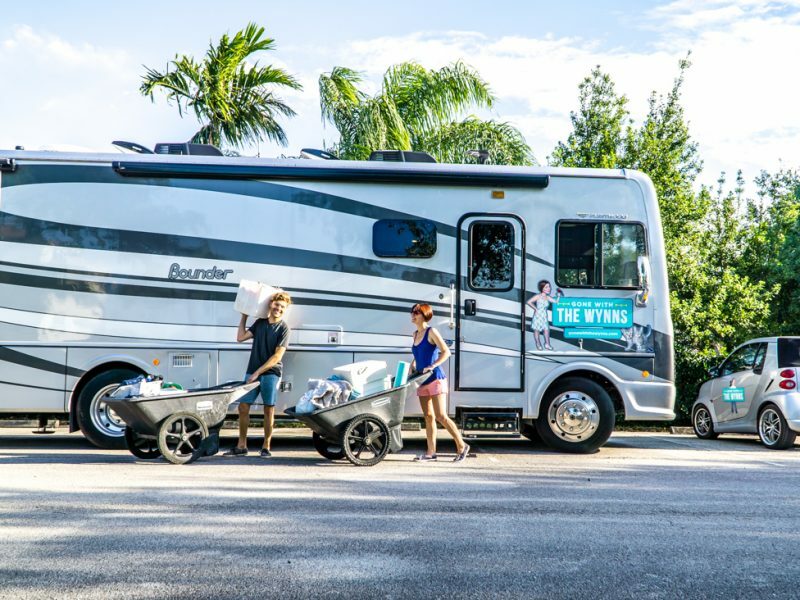 Good news is, we spent so much time researching and making grand plans, we are all set for our next road trip to Alaska. 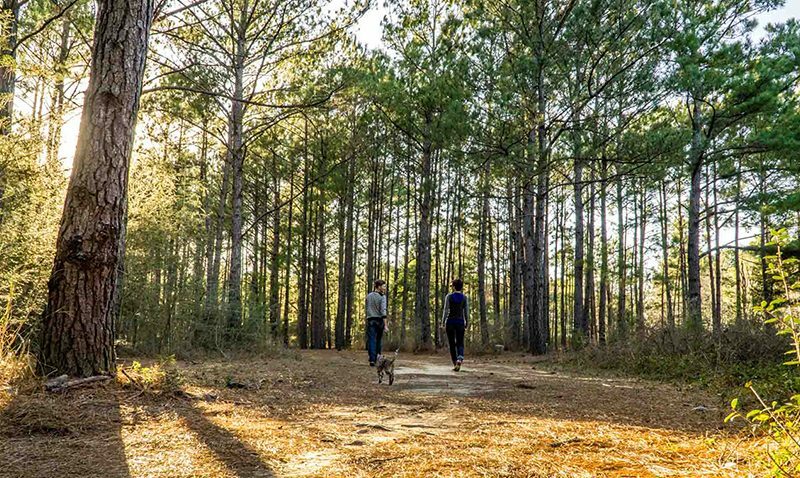 If you’re thinking of heading north here’s what we thought would be a worthy adventure: Take the RV, hike and climb Finger Mountain (Mile Marker 98), snap a photo at the Arctic Circle (Mile Marker 115), Camp at Marion Creek BLM Campground (Mile Marker 180). Continue on to Sukakpak Mountain for hiking (Mile Marker 204), loads of hiking and photo opportunities throughout the Brooks Range (Mile Marker 235 – Mile Marker 300). We decided dropping back into the flat tundra and continuing onto Deadhorse (Mile Marker 414) was unnecessary so we planned to turnaround at Mile Marker 300 and setup camp at Galbraith Lake before heading back to Fairbanks. This one was WAY up on our list of must-do spots but sometimes nature works against us in every way possible! Most everyone knows about the resort at Chena Hot Springs, the naturally landscaped pools are an extremely popular tourist destination. Most of the locals say they don’t bother with the springs during the summer months due to all the tourists (and heat), so I’m guessing it gets pretty busy up there with tour busses. 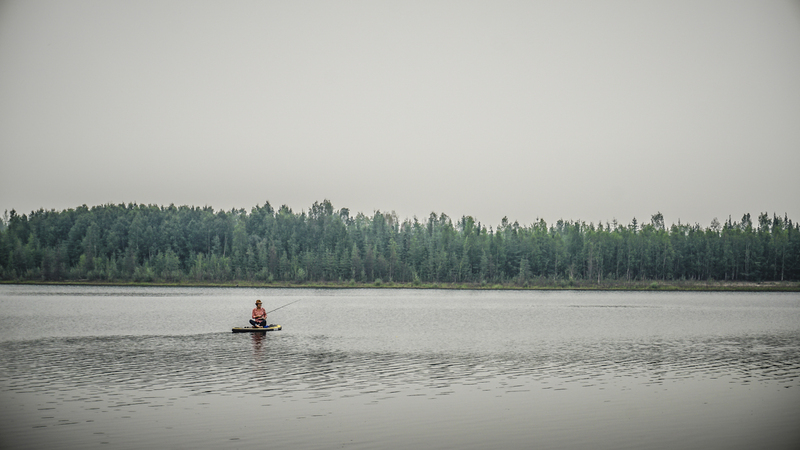 The big draw for us was the Chena River State Recreation Area. 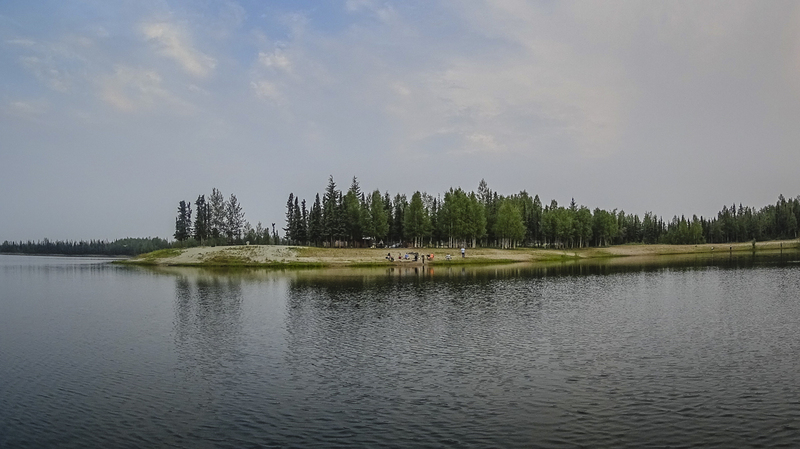 We planned to spend a few days at Rosehip Campground directly on the Chena River. 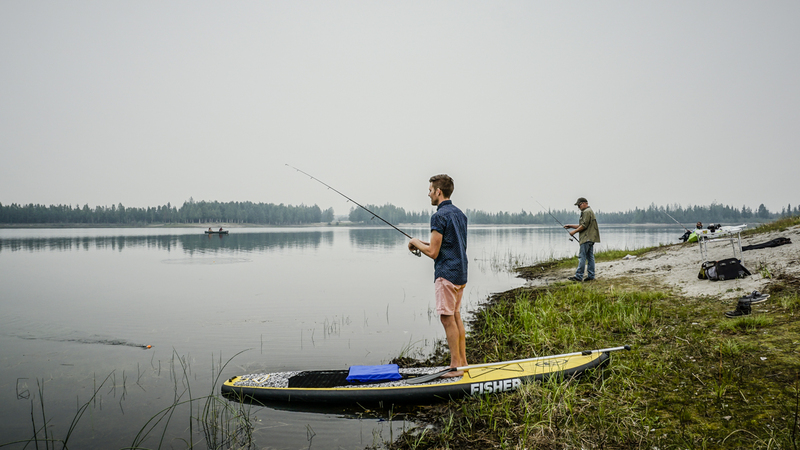 Great opportunities for fishing and paddling right from our site! From there we wanted to head up to the Granite Tors Trail for what we were told is a spectacular 15 mile loop through the 100 ft. high granite tors with killer views of the entire valley. Our next hike on the list is an easier 3.5 mile loop called Angel Rocks. We figured a nice long soak in the hot springs would be well earned after a couple days of hiking! Sounds perfect right? So what happened? Several fires sparked in the 2 days before our planned trip up Chena Hot Springs Road causing the smoke to settle in pretty heavy destroying any potential for good views, combine that with the 80+ degree days and all the sudden lounging around in hot water doesn’t sound too appealing. In our original plans we thought we could make it to Circle and Manby Hot springs but due to time restraints we took these two off the list. Based on feedback from the Fairbanks locals Circle didn’t seem like it was worth the several hour dirt road drive “there’s not really anything worth seeing or doing up there” according to a few people. We received mixed reviews from the locals on Manby: The road is extremely rough. Do you really want to drive 5 hours to sit in a concrete hot tub? The greenhouse sounded unique but its better when the weather is cooler and not so smoky. Other than the hot spring (and we were told Chena was more impressive) there’s literally nothing else there (so we were repeatedly told). Fuel Prices – Fuel is the least expensive we’ve seen in a while at $3.40 per gallon for regular unleaded gasoline. Road Conditions – Everywhere we drove in Fairbanks was well maintained with only a few small patches of construction. Weather – Temperatures were warm, like T-shirt and shorts warm, and since the sun never really set it was hot till late in the evening. Highs in the mid 80’s and the lows in the mid 50’s. How did you celebrate the longest day of the year wherever you were? 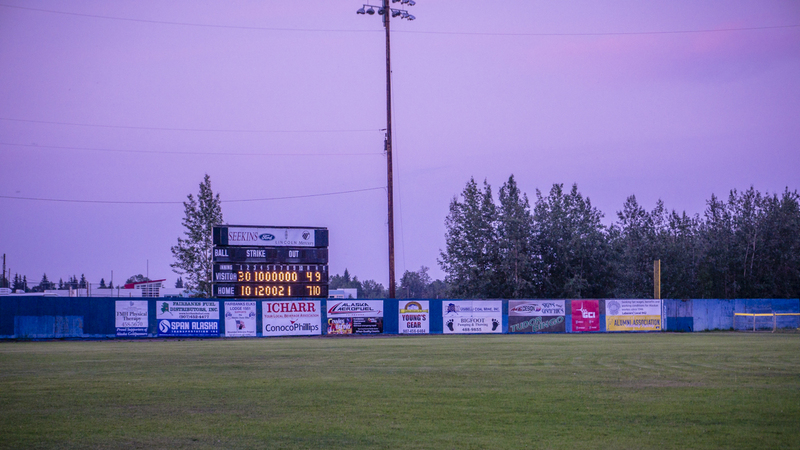 If you’ve spent time in Fairbanks tell us what you think about the town and some of your favorite spots. We love hearing from you so please share in the comments below! Jason, I have to ask you something really important. When are you leaving Nikki for Selfie Stick? You two have a really great bond and I think there’s a baby tripod on your two’s future. It was a lot of fun! The Pineapple is Jason Snow of the Snowmads who is a fellow traveler and in the group photos too. We have met up with them in a few different places now over the past couple of years. They are a lot of fun! We really enjoy your posts. Please keep up the great work. Love all the videos. Okay, I’m convinced now after ALL the pics I’ve seen over the months on your website that Nikki should be a model. Seriously. So gorgeous and utterly photogenic plus, as you know Jason, she possesses the intangible…that “look”. So so gorgeous. Did I mention that already? Not to be outdone, Jason, you are such a phenomenal photographer. Really. Your shots are amazing-well framed, composed, lit, and always appealing. I cannot imagine you two not taking advantage of this somehow…somehow. “Product company selling Widget X wants a series of shots with an artfully dressed, petite girl with BIG Colgate smile to show said widget with Mt Rushmore/Tetons/Yosemite/Whatever as backdrop. Submit all shots within 3 month time frame.” Could help with some of your planning, huh? Anyway, there’s got to be a way to make this work. Really, you two are such a great team. Jason the Artist and Nikki the Talent. Just remember us Liliputians. Great video! What camera are you using? Is the audio coming off of the cameras microphone? Again great video. It’s my little Sony a6000 with the extra mic. You can find all my camera gear in our store https://www.gonewiththewynns.com/store under the “Cameras and Computers” tab. That was so much fun! Thank you for a fun post for the beginning of my day. Ha!! Best video yet. You guys are a hoot! A 10K while drinking is not a trivial feat. It *feels* like a marathon! Well done! Thanks for taking the time to write such a great post and make that fun video! Great blog, the vid was hilarious. I gotta hand it to you, running and drinking beer, dang! As always great advice, some day I’ll make it up there. By the way, what did you guys use to repel the pesky mosquitoes? Jason, happy belated birthday – cent’ anni! And to the sweetest couple I “know” on the Internet, Happy 9th Anniversary!! Woot-woot! That was a very entertaining 10 minutes. You two are just hysterical. I loved it! 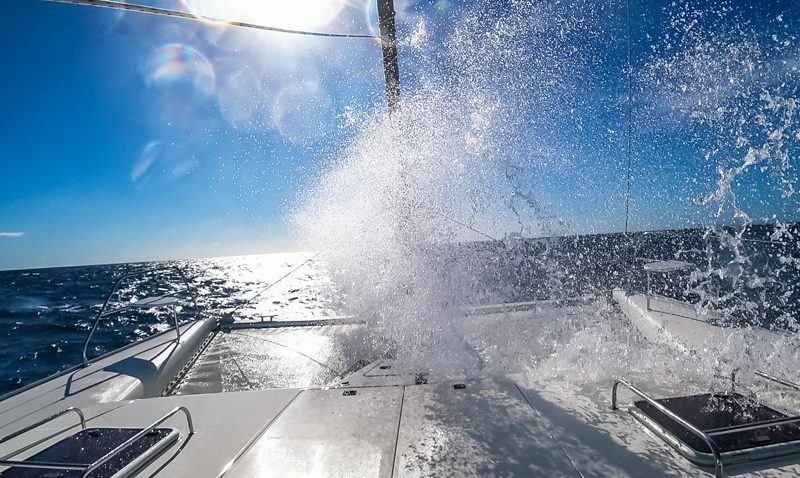 We can’t wait to follow your next adventure ! Happy Anniversary and Birthday, even though it’s late. I love hearing about all your adventures around the USA and Canada. I have never been to Alaska, but I hope to go someday. Keep having fun. Again you made me laugh with your videos. From broken windshields, fixing a flat, to a 10k race, your keeping us looking forward to the next video adventure your enjoying. Great job on having fun. Be safe and take lots of pictures. I truly enjoy your postings. I feel as if I had made the journey too. BTW, I can’t understand why gasoline costs a dollar a gallon more in Alaska than it does in NJ, where we reside. After all, Alaska is the source of millions and millions of pumped oil annually. I can only assume that the crude oil has to be shipped to one of the lower 48 states,refined, and the gas shipped back to Alaska. You chaps are brilliant! Love following your adventures and your lust for life is contagious! I can fully appreciate all the work that goes into doing what you do! Keep on keeping on! Yep, it’s official. You two live the most interesting, exciting, memorable lifestyle of anyone I keep up with. No doubt about it, you are most definitely qualified to mentor any and all couples on how to enjoy life!! 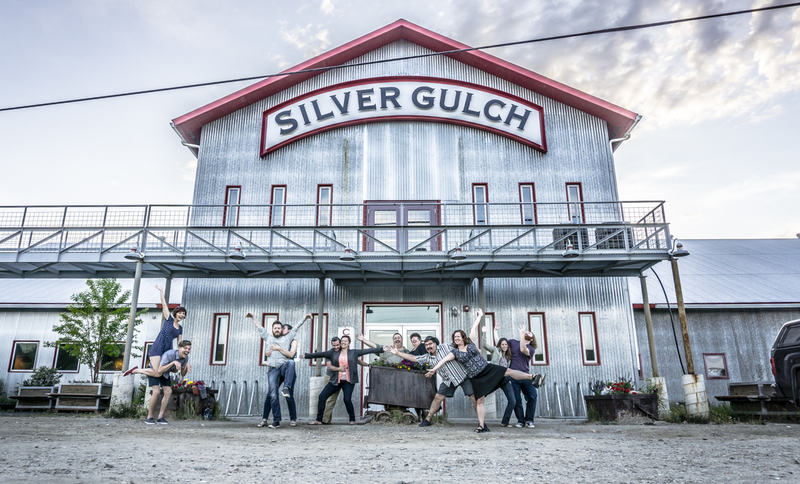 Keep on rolling my classy hobos…..you got it right! You guys are so funny, cute and adorable…. what a run that was. I dont know if I could run and drink beer tho. One or the other usually. And the icing on that delicious cake was recognizing all my faves bloggers …. oh there’s Snowmads… and there´s Technomadia and the Banks and… and…. before they were identified in the video. 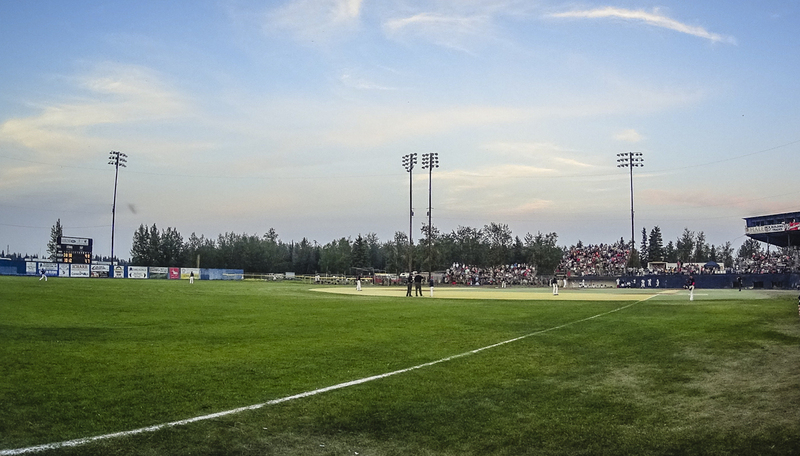 Fairbanks is 2nd largest city. Juneau is 3rd. 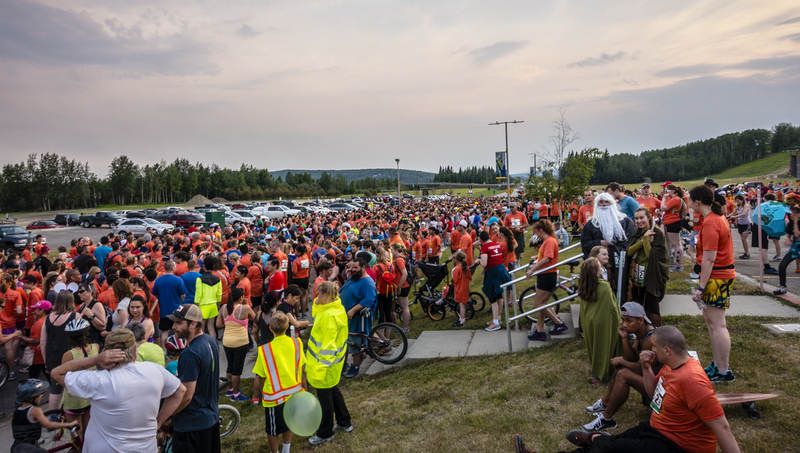 I was reading Technomadia ‘s post about the ” Midnight Sun Run ” , and thought I saw you both in one of their photos. Small world! Enjoy the rest of your adventure. Loved the race!!! So funny!! You did it, selfie stick!!! Cracked me UP!!! Absolutely love you guys!!! Although you wouldn’t know it because I never get the opportunity to comment!! Thank you to my very distracting children, lol. You Seriously need a show on Travel Channel!!! I’d totally support…. petition anyone??? Lol.. hmmmm, ok, so international for 35th bday??? are you thinking across the ocean to Europe or Australia?? I can see some adventures there!! I’ve always wanted to see Scotland! And from your guys perspective it would rock!! Happy birthday, dude!! I just turned 33, well not on your special day, but in July… but I hear 34 isn’t too bad!! We spent a few days in and around Fairbanks. I was not going to go to the Antique Auto Museum, but Karin wanted to and it was an excellent experience. Fabulous workmanship and fascinating auto designs. You can see a few photos on my blog. Also, we did get to Chena Hot Springs, and it’s interesting and kinda cool but yes quite touristy. We also more enjoyed the huge Rec Area and its wildness. We made a “quarter-run” up the Dalton, turning around at the Yukon River. Got to watch some fire-fighting, but the smoke wasn’t so fierce at the time of our visit. I haven’t been to Fairbanks yet. Looks like I need to go. A local told me this is the place to see the Northern Lights which is on my list. Love the video and the spirit of the locals that made the event. It looked like a great day. Great job on the video, and looking forward to many more from Alaska. 1. JASON: More cowbell. He’s got cowbell! JASON: No! We can’t. You can do it Pineapple! We’re gonna get (heavy breathing) a good time. Huhhhhhh…(cough then prepatory throat clear followed by lengthy swig from nearly empty bottle of IPA). So awesome. I cannot help but just chuckle at the gems in this. Neither one of you even stopped for actual water but seemed to hit up any and every pit crew for “adult” refreshments, libations, brews and spirits. That’s the spirit! You did however break a record in my book: over 2 hours for a 10K. Wowza! All in the name of fun.